This year, at the 2nd Annual SouthWare Partner Alliance User Conference, we are proud to announce our New User Boot Camp. In this two-hour course, SouthWare users will be able to get up-to-speed quickly in learning key tools and user interface tricks that make SouthWare a great business resource. If you are a new user of SouthWare or someone who would like a refresher, this course is a great option for you! Register today. Cybercrime is now more profitable than the global trade in marijuana, cocaine and heroin combined. Learn about tools and strategies to protect yourself and your business from this growing threat. The SouthWare Partner Alliance is pleased to announce that Glenda R. Snodgrass will be delivering a keynote address at the 2019 User Conference. Ms. Snodgrass has been President, lead consultant and project manager at The Net Effect since the company's inception in 1996. She is primarily engaged in cyber security training, threat analysis and mitigation for commercial, non-profit and governmental organizations. A frequent contributor to Tripwire's The State of Security blog and Business View magazine, she also provides expert witness testimony in technology-related court cases. Her dynamic personality and effective teaching style have made her a sought-after public speaker and corporate trainer for more than twenty years. 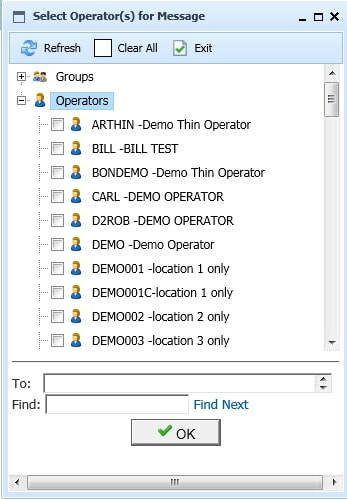 When creating a new TWIC message, a search option is available to find a SwiftMate operator for the intended recipient. You now have the option to retain information about closed quotes in quote history files. This allows you to review and analyze past quotes, and it allows you to remove closed quotes from the open order file without losing the quote information. 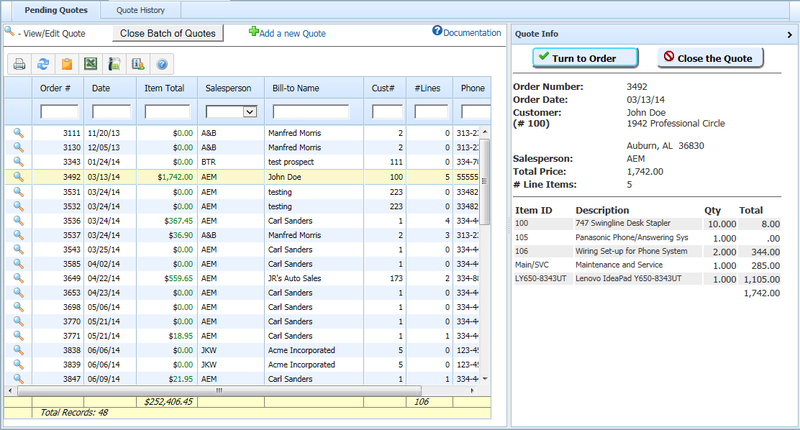 To use this feature, set the quote history flag to "Y" in the Inventory Sales control record (IS-08-02 field 24). After you activate this feature, each quote that is turned into an order or closed will be copied to quote history. You may then access the quotes in history via ReportMate or the Sales Quote Review portal. Previous to this change, when a comma delimited file contained two double quotes within a field, both double quotes would be imported into the field. Example: A field that contains 3 1/2 “” will now import as 3 1/2 “. Sometimes the import file could have created a new field if a comma existed within a field. That problem has been addressed as well. NOTE: Make sure your import format header indicates that the fields are delimited by quotes for this feature to work correctly. Portals that call out to Google will now use https if SSL is turned on in the NetLink Control record. Revision 16 documentation updated to include portal changes. Two new Box 12 types GG Qualified Equity Grants Income and HH Aggregate Deferrals under Section 83i. This brings Box 12 codes to 29. RA record position 20-23 Software Vendor Code should be populated. SouthWare's vendor code is 1709. These new changes require a CMSS expiration date of at least 10/31/18. New programs are only required if submitting the EFW2 file or you need the two new BOX 12 types on the printed forms. When exporting a RM report to a CSV file, ReportMate will now add an extra " if a field contains a " to be more consistent with CSV standards. The SouthWare Partner Alliance (SPA) is the premier association of SouthWare Solution Partners - providing SouthWare Solutions, Technology, Training and Support Services. For more information about the SouthWare Partner Alliance or the 2018 User Conference, please contact your SouthWare partner.